Cooking is a very easy skill to train; it is also very interesting. It allows you to cook many types of meats, fish, wine, cakes and more! 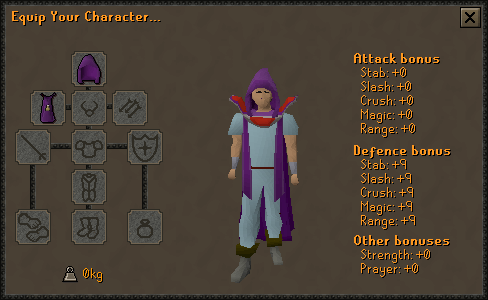 Also, upon achieving level 99 in this skill you could get yourself a cool purple cape and an awesome emote. This guide will show you what food to cook, where to cook the food, how to get food, how much experience you will earn per hour, and other tips on how to raise your cooking skill. Welcome to your cool new skill, Cooking! This section will show you what to cook until you reach level 10. You should already have a whopping 70 XP from Tutorial Island, so let's get started. Firstly, you could do a few things. One of them is complete the quest, Cook's Assistant. Upon completion of the quest you will be granted 300 Cooking XP. This will raise your level to 4, meaning you will burn less food. Remember, you don't have to do that quest, but it's there if you need that extra XP. The next part of this section is the cooking part. If you are in Lumbridge, go to the chicken area and collect raw chickens that are on the floor. To the east of the chickens is a cow field. Collect raw beef. 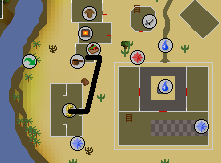 Below is a map of where you will be collecting your food, and where you could cook it if you want to complete Cook's Assistant Quest. You need to collect 65 pieces of food. If your have done the quest, that will be a bit less, around 55 raw pieces of food. When you have a full inventory, go to the Lumbridge Castle or the cooking pot inside the house that is near the chicken pen. Cook the food on the Cook's range. This special range will help you burn less food, but you can only use it if you have completed the Cook's Assistant Quest. If you haven't completed that quest, you will need to find a fire to cook on. Each chicken or beef gives 30 XP each, so before you know it, your Cooking level should be 10! Congratulations! This method is identical to the last, except now you will burn less food! To collect the raw food, refer to the map above. Once you have your raw food, you can cook it on the Cook's range if you have completed the Cook's Assistant quest. You'll need to collect around 350 raw beef and chicken to get to level 25. The exact number is 223, but remember you will still burn lots of food. Using the Cook's range will help minimize burning. Egg - Eggs are obtained from the Lumbridge chicken pen or can be bought from the Culinaromancer's Chest or in Rellekka. Bowl - You can get bowls from General Stores and from the Culinaromancer's Chest. Withdraw 13 bowls and 13 eggs, or take them from your larder. Use your eggs with the bowls. Cook the eggs on a range. From level 13, which is required to make the eggs, you'll need to make 120 of them. However, because you may burn the eggs, 160 bowls of eggs is a good number. Remember to use the Cook's Range in Lumbridge to help you burn less food! For this stage, you will be cooking trout, and you'll need level 15 Cooking. What you will need to do is this: go to Barbarian Village, which is west of Varrock. Follow this map to get there if you are unsure. Enter yourself into a highly populated world, such as worlds 1, 3, 5, or 7. Once you enter these words, begin to say: "taking free raws", or pick up any fish that players may drop. However, if you plan on fishing your raws, you will need feathers and a fly fishing rod. Both can be bought in Port Sarim or the Catherby fishing shop for a small price. This method of obtaining your own fish is faster and much more reliable. When you have a full inventory, run north into Edgeville. 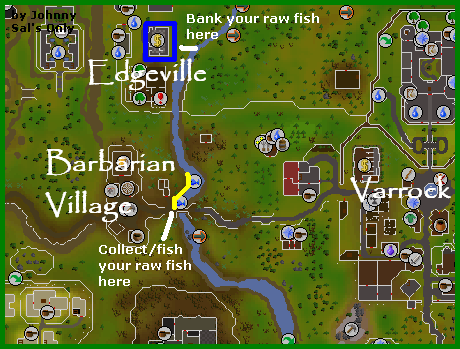 Bank your raw fish, and then run back to Barbarian Village. 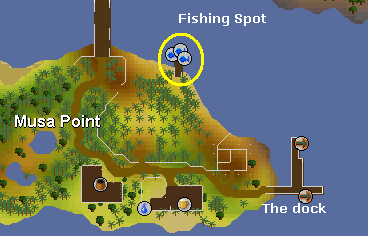 This technique can also be done in Lumbridge, but you are less likely to encounter fishers. You will only need about 120 pieces of trout to achieve level 25 Cooking. The exact number is 78, but remember, you could burn. 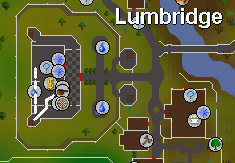 To minimize burning, use the special range in Lumbridge. You can do two things for these levels. Egg - Eggs are obtained from the Lumbridge chicken pen or can be bought from the Culinaromancer's Chest. To reach level 40, you'll need to make exactly 588 scrambled eggs. However, you'll burn quite a few bowls of eggs, so getting ingredients to make 620 is recommended. Nevertheless, if you're only raising it to 35 so you can cook pizza and wine, you'll only need 292. This number should be taken up to 330 in case you burn too many. Buckets of water - Buckets can be bought from General Stores and filled with water from any water source, like a sink or fountain. 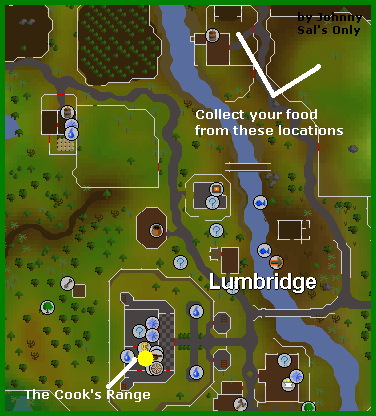 Flour - Flour can be obtained in the Port Sarim grocery store and the Culinaromancer's Chest. One of the best ways to obtain flour is by using empty pots on the flour sacks in the Sinclair Mansion. This gives very fast flour, and barely takes any time at all to get. 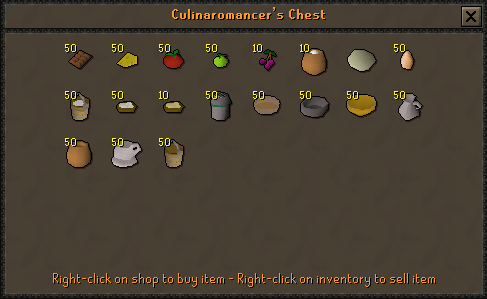 Tomato - Tomatoes can be bought from the Port Sarim grocery store, or from the Culinaromancer's Chest. It can also be found in the Bandit Camp in the wilderness. Cheese - Cheese can be bought from the Culinaromancer's Chest and found in the wilderness Bandit Camp. It can also be found in Aggie the witch's house in Draynor. Get 14 pots of flour and buckets of water in your inventory, and use them with each other. Then choose to make pizza bases. Once you have made enough bases, withdraw 14 of them and 14 tomatoes. Use the tomatoes on the bases. Withdraw 14 half made pizzas, and 14 bits of cheese. Use the cheese with the half made pizzas. Get 28 uncooked pizzas and cook them on a range. Grapes - Found in the Cooks' Guild or the Phoenix Gang hideout. They can also be bought from the Culinaromancer's Chest for 1gp each. Jug of water - Jugs can be bought from the Culinaromancer's Chest or General Stores for 1 gp each. They also respawn on the second floor of the Cooks' Guild. Fill it up at a fountain or sink. Fill jugs with water, and withdraw 14 from your bank. After obtaining grapes, withdraw 14 from your bank. Move one of the jugs of water or grapes to the bottom of your inventory, next to the opposite ingredient. Use the grapes with your jug of water until there are no more left. Put everything in your bank. Wait 15 seconds for the wine to ferment, and voila, 200 cooking XP! There is no specific amount of XP that can be earned while doing this, as your technique may vary. Also, it is unlikely you will have enough ingredients to make wine for a whole hour, but in an hour you will get 375,000 cooking XP! For level 40, from level 35, you only need around 80 grapes and jugs of water. The exact amount is 75, but sometimes your wine will go bad. At a level like 40-50, you're starting to get into cooking lobsters. These won't be very useful to you at this level, because you will burn too many. Using these methods will help you get lots of XP. Cake Tin - Cake tins can be bought from the General Store in Ardougne and found in the Cooks' Guild. Pot of Flour - Flour can be obtained in the Sinclair Mansion in Ardougne by using a pot with the flour sacks. Another way is use wheat with the windmill and collect the flour with a pot. Bucket of Milk - Milk can be obtained by milking a dairy cow. A dairy cow can be found in the Lumbridge cow field. Milk can also be bought in the Culinaromancer's Chest. Egg - Eggs can be found in the Lumbridge chicken pen, or bought from the Culinaromancer's Chest. Withdraw your cake tin into your inventory. Withdraw 9 eggs, 9 pots of flour and 9 buckets of milk. To be exact, you need 357 cakes to reach level 50, but that should be made up to around 450 incase you burn any. Grapes - Found in the Cooks' Guild or the Phoenix Gang hideout. They can also be bought from the Culinaromancer's Chest for 1 gp each. Jug of water - Jugs can be bought from the Culinaromancer's Chest for 1 gp each. They can also be bought from General Stores. Fill it up at a fountain or sink. If you want to get level 50 Cooking from level 40, you need to make 400 wines. The exact number is 350, but some may go bad. It's better to be safe than sorry. If you're between the levels of 50-70, new fish like lobsters and swordfish can be cooked without too much burning. These few fast methods should make sure you reach level 70 in a minimal amount of time. Lobsters are a good fish for cooking. They give 120 XP each, and can be bought and sold at basically the same price. There are two ways to obtain these fish. (i) Catherby. This is beyond the White Wolf Mountain and is the most common place to catch lobsters for members. Bank or cook your fish to the west. (ii) Musa Point. You need 30gp to get on the Island. However if you have a Ring Of Charos (a), you can get to Musa Point for free. 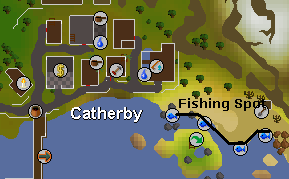 You could Falador teleport if you wish to bank your fish quickly. (iii) The Fishing Guild. This require level 68 Fishing to enter, or 65 with a Fishing Potion. 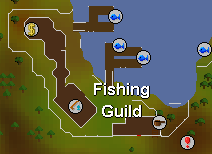 The "F" and "Y" docks are the fishing spots. There is a range here, but it is recommended that you bank your fish first, then cook them. B) Buy the fish yourself. This is much faster although you will lose money in the process. 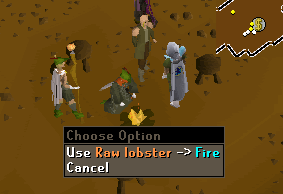 Lobsters can be bought raw in World 1 for 230 GP each (1/6/07) and sold cooked for 200-220gp each. See the World One Trading guide for a detailed explanation. Overall, you need 5,303 Lobsters to get to level 70 Cooking. Making that number closer to 6,000 would be a much safer bet incase you burn lots of Lobsters. Those can be all bought for around 1.3M (1/5/07), or fished for free. Another thing to note is this; if you have completed the Family Crest quest and chose the Cooking Gauntlets, you will not burn lobsters at level 68 cooking. Despite wine has already been mentioned several times, it is still a very good method for XP, and it will continue to be until level 70! This section will tell you how many you need and the XP given. Also a small note on powercooking is given. The usual ingredients are needed, grapes and a jug of water. Incase you don't already know, this is how to obtain them. That method for making the wine is fastest and will maximize XP. You need to make around 3,250 wines to get to level 70. The exact number is 3,182, but sometimes you may make one or two bad wines. That's 3,250 grapes and jugs of water overall. You are up there with the best chefs in RuneScape, and that is something to be proud of. These next few tips for raising your level will help you reach 85. Lobsters are now a very good way to raise you level for one main reason. That reason being if you have the Cooking Gauntlets from the Family Crest quest, you will not burn any lobsters now. In fact, you will stop burning them at level 68 with the gloves! This means now you will have an exact number to cook. Use the tips above for methods to obtain the fish. But first, you need to know how many lobsters you need to cook to reach level 85. The number is 21,009. If you have cooking gauntlets, there is no need to get extra lobsters because you won't burn anything! When you have those, this method for making the wine is fastest, because you are filling your inventory with ingredients. This is a really easy, simple, cheap and fast way to level your cooking. You will rarely make any wine go bad at this level. Now for the important part of the section, how much you will need and the XP per hour. The exact amount of wine needed is 12,605, but that should be up to 12,670 incase any goes bad. Pizza is a fun and effective way to level cooking. One of the possible problem could be there are lots of ingredients. This is how to obtain them. Meat - Obtained by killing chickens or cows and cooking their raw bodies. Anchovies - You can fish these with a net in Al Kharid and the wilderness Bandit Camp. Pineapple slices - Obtained by picking a pineapple on Karamja and using a knife with it, then selecting slices. Add meat, anchovies or pineapple slices if you wish. This will get you more XP. That method should ensure the fastest XP is earned. For level 85, you need to cook 17,630 plain pizzas to get to level 85. Remember it's an exact number because you won't burn any. You'll need around 13,500 pineapple pizzas, 14,000 anchovy pizzas and 15,100 meat pizzas. You may burn those sometimes. This is the final stretch to level 99, starting at 85. These techniques will ensure the fastest and easiest ways to 99, and some very cheap methods, too! Until level 94 where you can cook sharks without burning them, lobsters, with monkfish, are the best fish to cook. If you need to know how to obtain them, refer to the levels 50-70 earlier in the guide for tips. As you can already successfully cook every lobster without burning any, all you need to know is the amount you need to cook to reach level 99. This may seem like a rather daunting number, but 81,466 is the amount of lobsters needed to reach 99 from 85. Remember that buying raw lobsters and selling them cooked will help you get there so much faster than obtaining 81,446 lobsters yourself. Cooking Monkfish is another good option for reaching level 99 as well as lobsters. You will stop burning Monkfish at level 90 with Cooking Gauntlets; without them you will cease to burn them at level 92. You can purchase these fish in world 2 Falador, or you can fish them using a fishing net if you have completed the quest Swan Song. To reach level 99 from 85, you need to cook 65,173 monkfish. Once you have as many of those as you need, this is the fastest way to transform those ingredients into wine. First of all, despite you can cook sharks much earlier than this, you will burn so many. At level 94, if you are an owner of the Cooking Gauntlets obtained from the Family Crest quest, you will not burn any sharks what so ever, making this the best XP out there! It is not recommended that you cook sharks without the gauntlets, because you will burn them, even at level 90! Sharks give 210 XP each, 10 more than wine, and they are much easier to obtain. You can get them in Falador, world 2. See the World 2 Trading guide for more information. To get to level 99 from 94, you need to cook 24,238 sharks. If you're looking here, you probably want to know, "where on RuneScape do you get grapes? ", or "how am I to know where to find a cake tin?". Well here is a list of where to find all the items if you are using the methods above. Anchovies You can fish these with a net in Al Kharid and the wilderness Bandit Camp. Cake Tin Found in the Chefs' Guild, or bought in the Ardougne General Store. They can also be bought in the Culinaromancer's Chest. Chocolate Bar Found in the Chefs' Guild, or bought from the Culinaromancer's Chest. They can also be bought from the Tree Gnome Stronghold food shop. Egg Found in the north east chicken pen in Lumbridge. The Culinaromancer's Chest stocks 50 Eggs, so that is another good way to get hold of them. 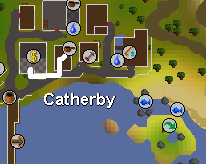 Feathers The Port Sarim, Catherby or Shilo Village fishing shop, or by killing Chickens. Flour One of the best ways to obtain flour is by using empty pots on the flour sacks in the Sinclair Mansion. This gives very fast flour, and barely takes any time at all to get. Another way is use wheat with the windmill and collect the flour with a pot. Pots can be bought from General Stores for a very small price. Fly Fishing Rod The Port Sarim or Shilo Village fishing shop for 5gp. Grapes Found in the Chefs' Guild, the Phoenix Gang hideout and bought in the Culinaromancer's chest. Jug of Water Jugs can be bought in mass amounts from the Culinaromancer's Chest and in smaller amounts from General Stores. To make it full of water, simply use it with a water source, like a sink or fountain. They can also be bought from the Culinaromancer's Chest. Lobster Pot The Port Sarim, Catherby or Shilo Village fishing shop. They cost 20gp. Meat Obtained by killing chickens or cows and cooking their raw bodies. Milk Milk a dairy cow. One can be found in the Lumbridge cow field. They can also be bought in the Culinaromancer's Chest. Pineapple Ring Obtained by picking a pineapple on Karamja and using a knife with it, then selecting slices. Small Fishing Net The Port Sarim or Catherby fishing shop. This special chest contains mass amounts of cooking supplies like Flour, Eggs, Grapes, Chocolate and more. These items can be bought from the chest, for a very small price. You can only access this chest upon completing the subquests in the Recipe for Disaster quest. This is what the food section of the Chest looks like. You're probably have lots of raw fish, but there's nowhere to cook it. Well here there will be a list of good places to cook your food. There will be a list or pros (good things) and cons (bad things) about each location. This range requires the completion of the quest Cook's Assistant. The special range helps you burn less food. You need to climb lots of stairs to get to and from the bank. People that close doors could slow your cooking. There aren't people constantly closing doors. It is fairly close to a bank. 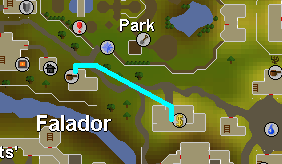 You need to pay to get into Al Kharid, but that shouldn't really be a problem because you can go in via the northern entrance. You can't teleport near the range unless you are a member. Doors won't be constantly opening and shutting. It's fairly close to a bank. It's not the shortest distance ever to the bank. It's extremely close to a bank. Lots of people will be using it, meaning crowding and opening doors. This fire is located practically next to the bank. The fire is one square away from a bank. It's only a fire, so you may burn some. But not to worry, because if you are powercooking that doesn't matter. There are lots of people and random events about, but the time taken is made up by the closeness to a bank. Sometimes cooking can just become boring. How about a fun quest to earn some valuable cooking XP? Yes please! This list will show you which quests give cooking XP and how much. The quests with a * sign following their name are Freeplay quests. A cook with a cooking level of 99 can wear the magnificent Cooking Skillcape of Achievement. This special cape is only available to the best chefs out there. You can get a Cooking Skillcape from the Chef in the Cooks' Guild for 99,000gp, and it even comes with a matching hood! The stats for the Skillcape are quite amazing for a cape, +9 to all Defence bonuses and +4 to prayer as well if your cape is trimmed. You can get a trimmed cape by obtaining two level 99 skills. The Cape even comes with its own brilliant emote!